My lovely friend Ceri let me know about a bakery in Hackney, fairly close to where I live, that she thought I’d like. She works in publishing and they recently published the cookbook for it – ‘The Violet Bakery Cookbook‘. I was lucky enough to be given a copy, which I’ll be giving away as a competition prize on my social media channels early next week, so keep your eyes peeled! I was planning to meet my friend, Laura, for lunch today, so we thought we’d check out the bakery. It was a stunning day today, barely a cloud in the sky, so it was the perfect day to visit. 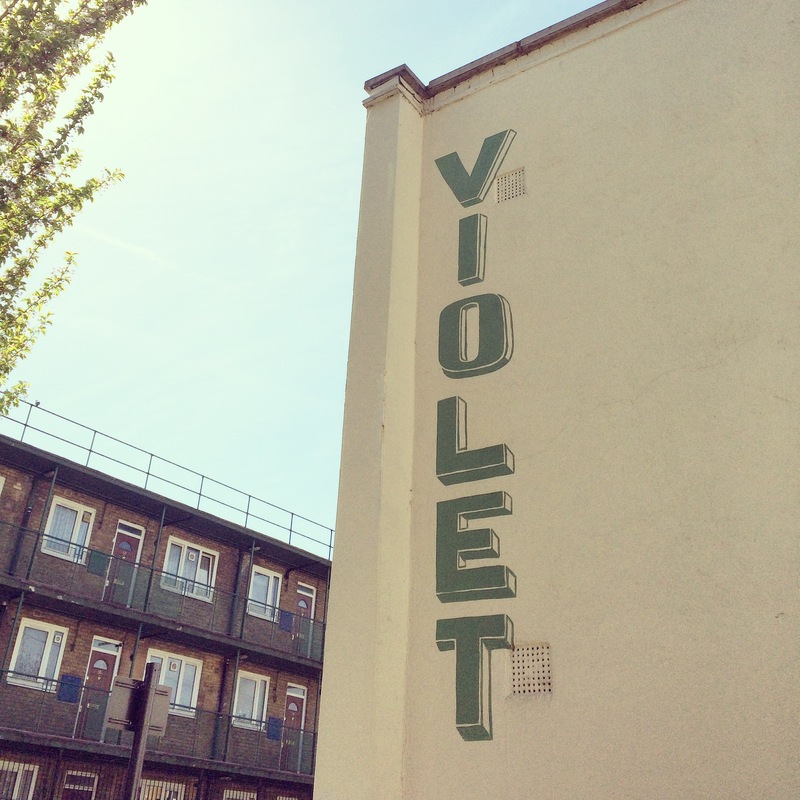 The Violet Bakery is situated on a side street (Wilton Way) parallel to the main road between Dalston Junction and Hackney Central overground stations. 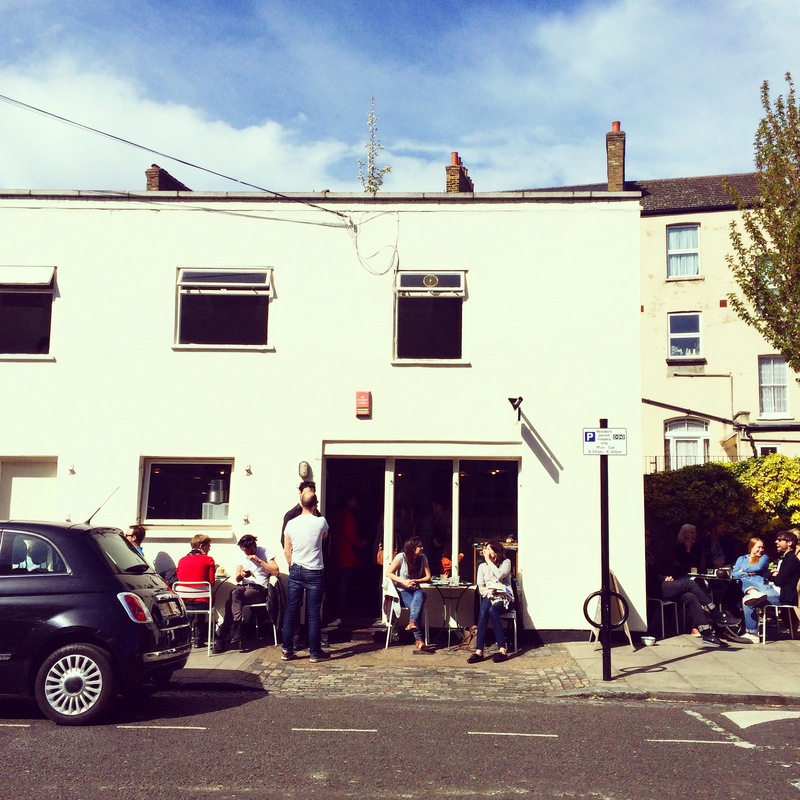 And you could easily miss it, with its neutral white walls and small entrance… if it wasn’t for the massive queue leading out of the door, and the groups of people dotted around it! This was clearly a popular place! The bakery has a few small tables dotted around the front and the side, with a couple located in the back garden area. But people were happily using nearby benches and even sitting down on the pavement to enjoy the goods! 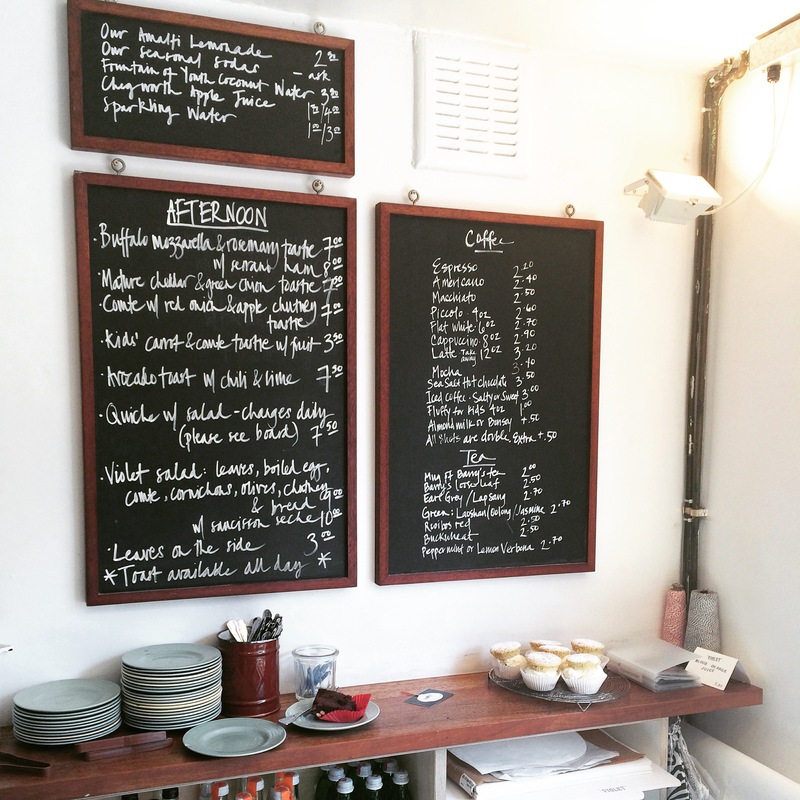 The bakery is owned by Claire Ptak, a San Francisco-born baker, who relocated to London after three years of training as a pastry chef at Chez Panisse in her native California. 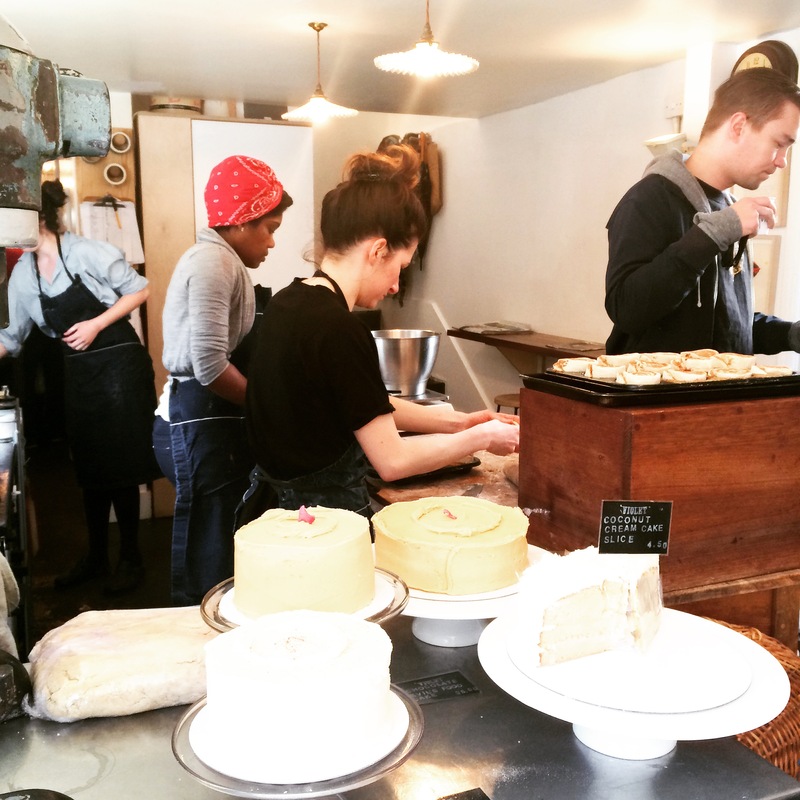 She started the business as a stall on Broadway Market (bringing in the delicious cakes from her kitchen at home) before opening the East London bakery in 2010. 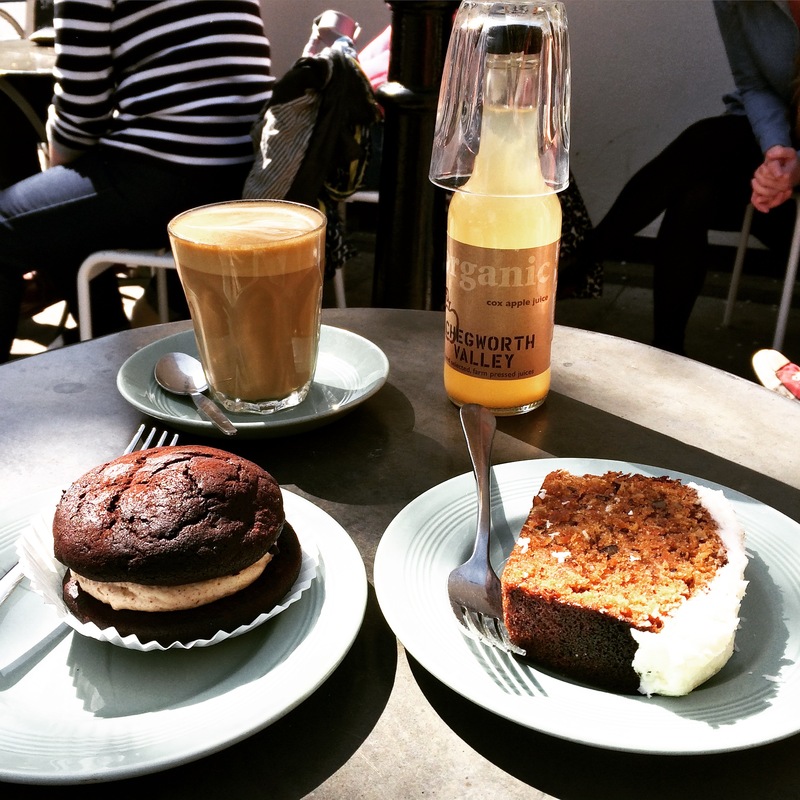 After managing to blag a table in the sun, I decided to go for something I’d never tried before, the whoopie pie (chocolate and peanut butter flavour), as I’d heard this was something of a ‘Claire Ptak special’ (and I’ve since seen she has a whole cookery book dedicated to them, which I might have to try out!) For those of you who haven’t tried one, it feels a bit like a cross between a macaron and a muffin, with a soft creamy filling. Laura went for the carrot and pecan slice. Both of which were delicious and full of flavour! 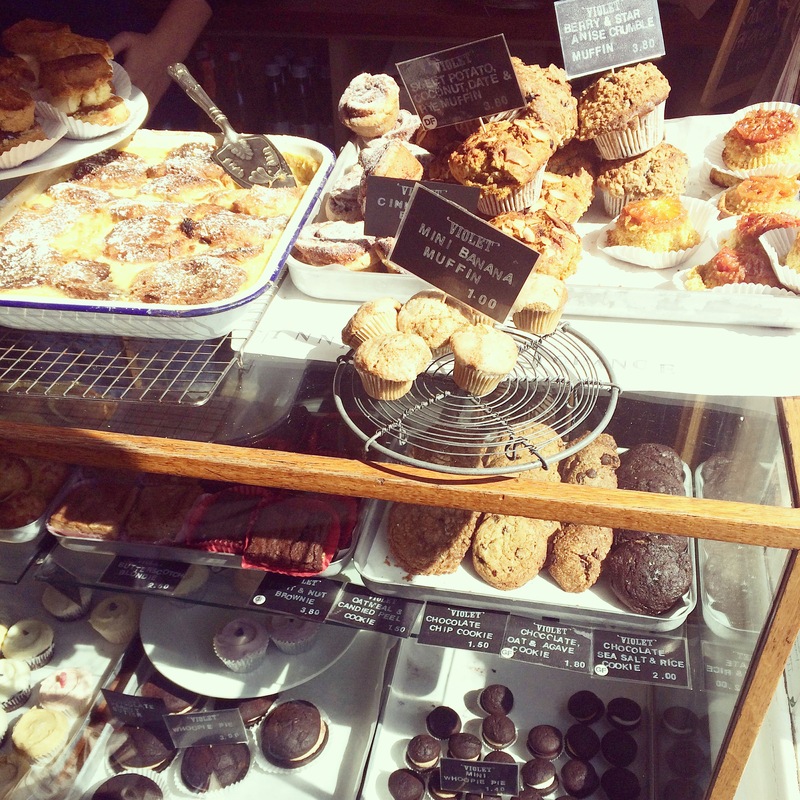 All of the cakes at Violet Bakery are baked with organic flour, sugar, milk and eggs, and organic ingredients are used wherever else possible for other items on the menu. What I didn’t realise before visiting the bakery is that they also offer savoury dishes, such as tartes, toasties, salads and quiches. Some people sitting around us ordered these, and they looked great! I’m going to be trying out a recipe from the cookbook for a Wild Blackberry Crumble Tart this evening, which I’ll write about soon, along with the competition to give away the cookbook. Previous PostTastesmiths Event: Cooking Fresh!